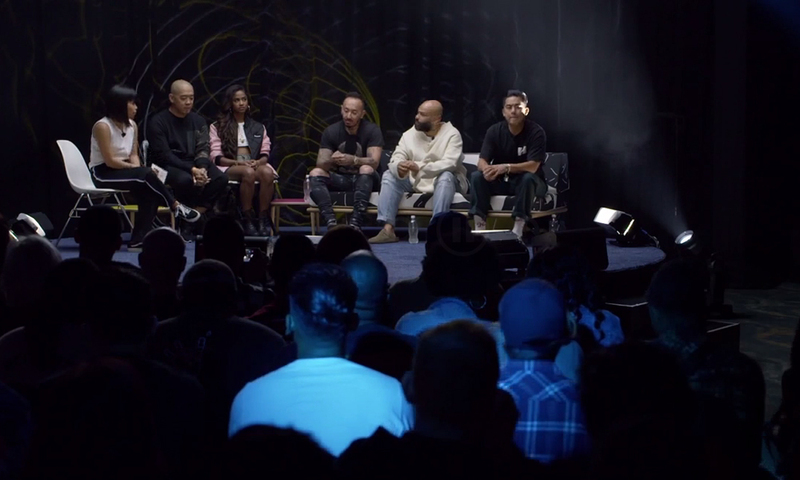 If you didn’t make it to ComplexCon, have no fear—we’re presenting one of the (many) panels that was held at the innovative trade show. This one, hosted by Complex style editor Karizza Sanchez and entitled “Thread Trajectory: The Future of Streetwear,” featured well-known streetwear community members—Jeff Staple of Staple Design, DJ and influencer Vashtie Kola, Rob Garcia of En|Noir, Chris Gibbs of Union, and our very own Bobby Hundreds. Karizza Sanchez discussing streetwear with panelists. Each panelist weighed in on what they believe defines streetwear, told stories about their beginnings within the community, and discussed where they think the industry is going. Not all had the same ideologies, and as Bobby stated, “[Streetwear] means something different to everybody… It’s impossible to answer [what it is].” However, there seemed to be common ground on the understanding that streetwear is a response to a dominant way of thinking, and a trend that is youth-driven and consistently redefining itself. What’s considered streetwear today may be gone tomorrow, but as fleeting as it all seems, these guys still held it down with their responses. Check out the informative panel here to brush up on your own understanding of streetwear.